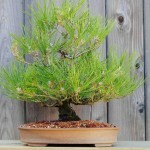 This pine was the subject of a recent post. The main goal for the next few years is to encourage backbudding so I can reduce the length of the branches. Grafting may even be in the agenda. 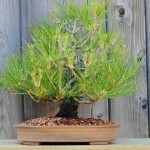 To achieve these things, I will need to make sure the tree is vigorous and comfortable in its pot. 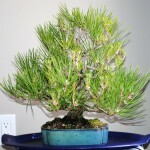 My understanding is that pines are best repotted just before the buds start to move. How can you identify this time? My friend gave me a handy tip: break off the tip of a dormant bud and check back the next day. 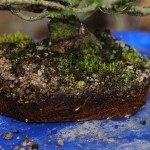 If there is sap flow, the tree is coming out of dormancy and it is a good time to repot. 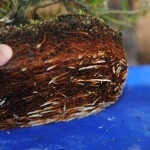 Another indicator is if the roots have started to grow, indicated by white tips. This tree tested positive for both of these indicators, therefore repotting was a go. For those of you in my climate – keep in mind this tree was just flown out from the Vancouver area in Janurary, and spent the winter in my garage at about 4 degrees C, therefore it is weeks ahead of any pines that were wintered outside. Roots are actively growing = ready for rootwork. After about 30 minutes of raking and root pruning. The Nick Lenz pot is intentionally oversized to permit vigorous root growth for the next few years. When I visited Aichi-en in Nagoya last winter I gained a new appreciation for the beauty and strength of Japanese Black Pines. I worked on a couple of them during my stay there and have been shopping around for one (or a few) every since I got back. However, good JBP are hard to come across around here. 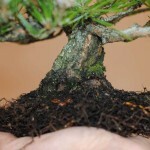 Bonsai nurseries don’t really exist in the Toronto area – the bonsai community is too small to support them so most of our good material comes from the Canadian Wilderness. If you can find a JBP worth buying in the USA, you have to deal with the hassle of importing it. Regardless, good ones are very rare and usually very expensive since they are usually Japanese imports. Field grown ones are often grown quickly and it shows in their bark characteristic, taper, and scars. Probably one of the best sources for JBP in Canada (if not the best) is Shikoku Bonsai near Vancouver, BC on the beautiful Sunshine Coast. Gerald Rainville is the proprietor and had the foresight to begin growing a variety of species from seed something like thirty years ago. The tree I got from him is over 20 years from seed and shows the characteristics of a slow, container grown pine (no scars, nice fine bark, no monstrous roots). Gerald was very helpful in providing information and extra pictures. His shipping methods are excellent and I feel that his prices are very reasonable considering the time that has already been invested in his plants. While this tree still has a long way to go in its bonsai-journey, I think that the development of the trunk thus far is excellent. I really think we as Canadians are lucky to have someone who is patiently developing material like this. The best part is that the vast majority of his stock is not shown on his website. Gerald has told me that they are “not ready for sale” which really has me excited to see what else he has. A taste of it can be seen on his Facebook page. I definitely hope to visit his nursery one day. Anyway, lets look at the tree I got. Trunk detail. Good taper, movement, and placement of the primary branches. I want to make this tree a compact shohin that is about half the current height. This will require a new apex in the bare middle section of the trunk which may have to be grafted. 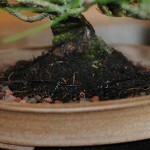 The focus of this growing season will be inspecting the roots, repotting if necessary, and encouraging backbudding on the branches which have gotten a bit lanky.